Actually there are many reasons for romantic dinners. 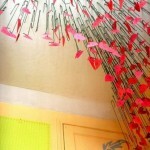 Valentine’s day, anniversary or simply a desire to remind once again about your feelings. It’s no secret that women love flowers, but classic ikebana and flower arrangements on tables making the colors that we used to see on holidays. It looks very nice but it’s usual. 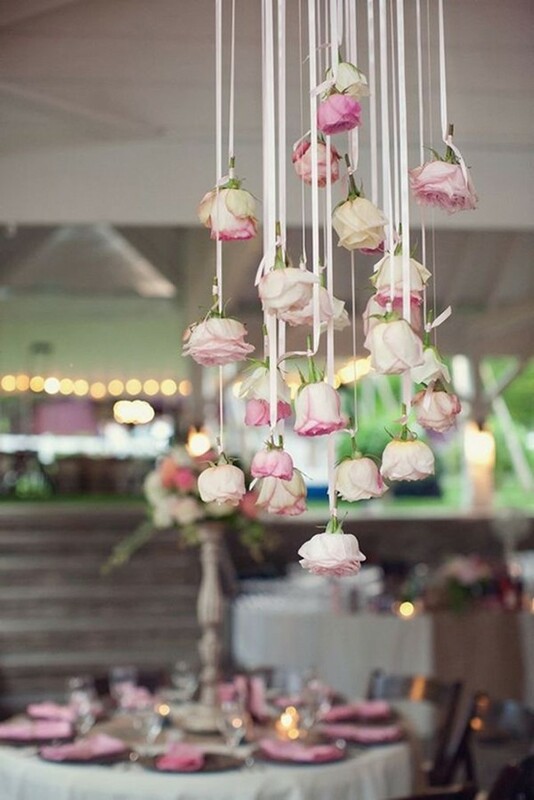 Hanging buds of roses – this is something fresh and it looks very air. Beautiful hanging tea buds of roses on the same ribbon colors – it looks very gently. 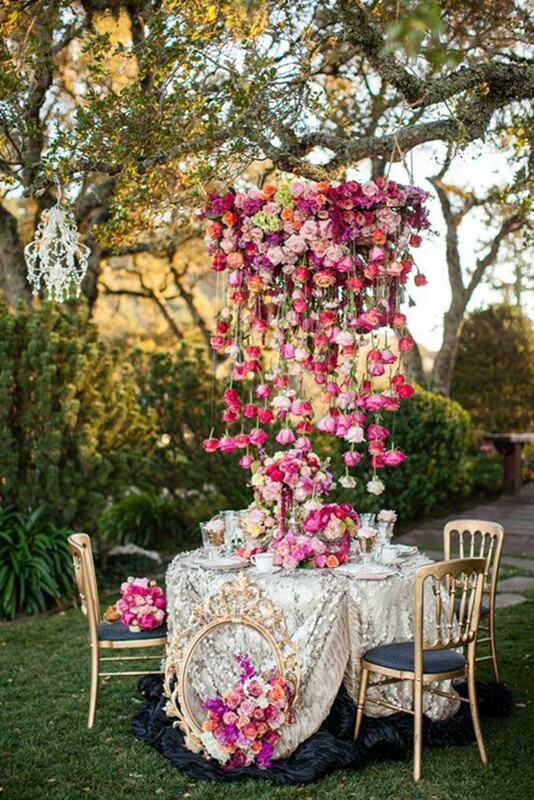 This chic embellishments over a table – it’s really great. This home decor, plus a suitable textiles and kitchen utensils is something that will make a fabulously beautiful all the Valentine’s Day or your anniversary. 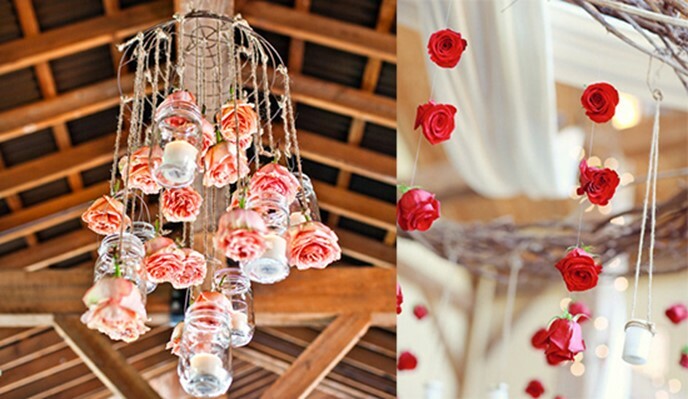 For a romantic holiday for couple, you can also get a kind of decorative chandelier from the hanging flowers and roses. The frame is wood hoop on that stick lace and ribbon are linked. Unobtrusive design rooms on the anniversary of the Roses should look that way. 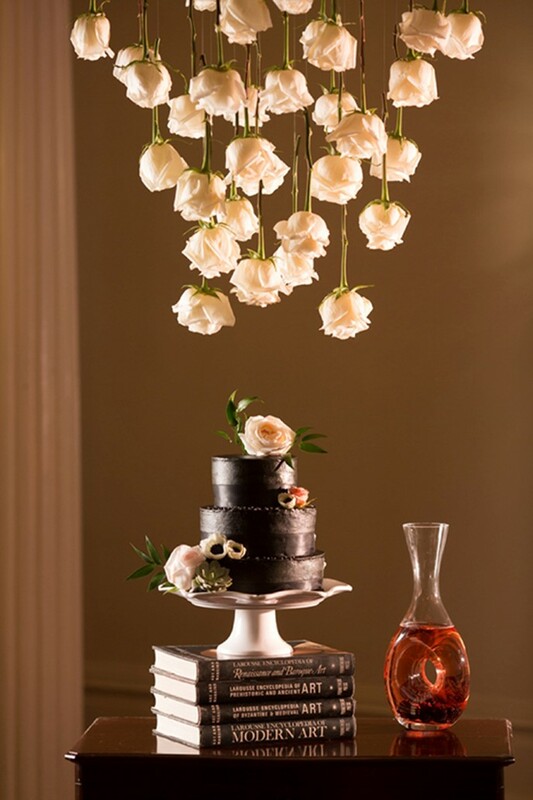 And chocolate cake perfectly complements the flower garland of roses. 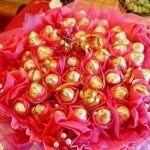 Decor roses with equal success will become prekrasnm decoration for wedding or any other romantic holiday. 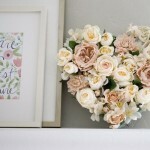 On Valentine’s Day, you can make a big gorgeus bouquet. 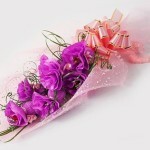 In addition, make surprise for your loved one – and decorate a small outboard bouquet of roses without any reason. 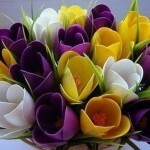 Although of course there is always a reason – it is your feelings. 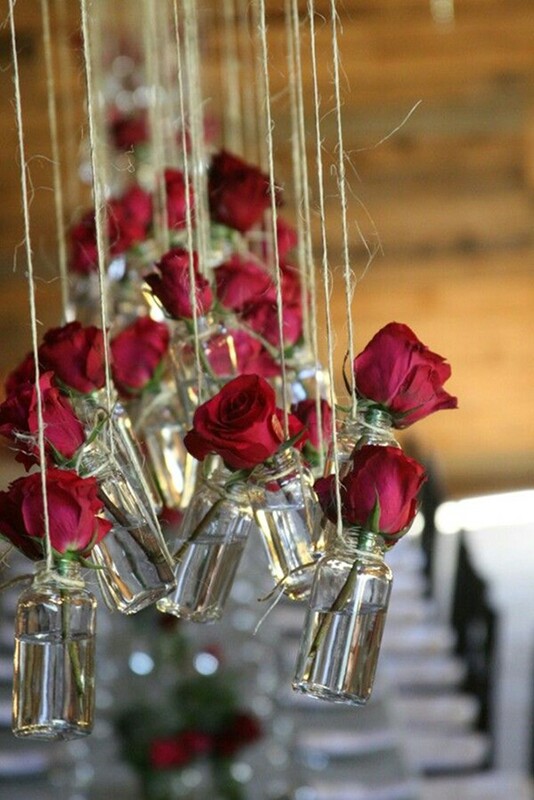 By the way, if it is a pity to leave roses without water, you can hang the little jars into which you can put all those same roses on short stems – it looks even more special. Roses on short stalks stand for in the water much longer. 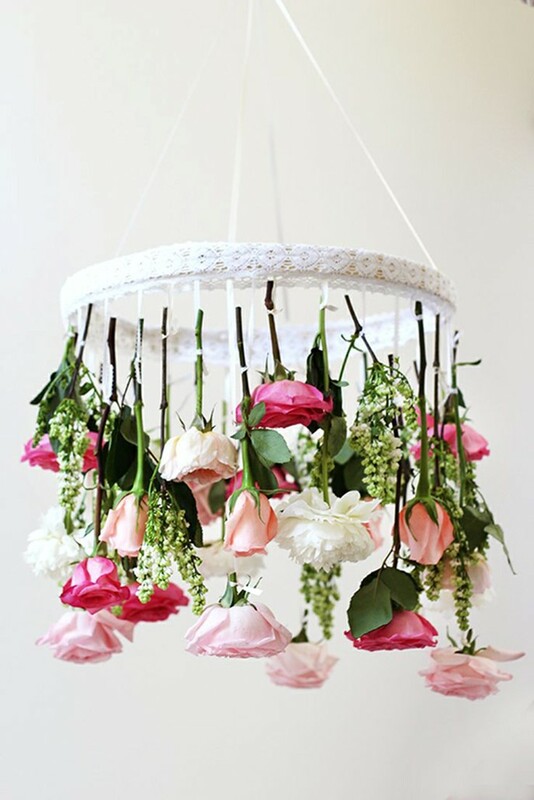 You can experiment with this romantic idea on Valentine’s Day – add a candle all in the same hanging pots. In the Dim light of candles and appearances of buds will truly enchanting atmosphere. Make your favorite cuddly romantic holiday. I hope this idea will be to your taste.